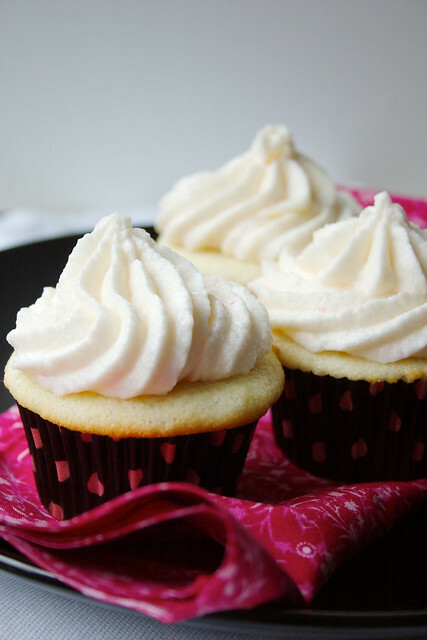 Who doesn’t love a good vanilla cupcake? I know I could use one of these right now along with a warm glass of milk in the wake of Sandy, which is headed directly toward the Philadelphia/NJ/NYC area. Times like this aren’t for dieting, right? 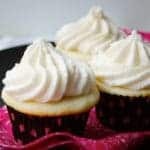 I’m hoping that I can breathe a sigh of relief in my next post after this storm has passed through..
Back to the cupcakes – there are so many versions of vanilla classic cupcakes that it’s difficult to decide which one to try. I chose a recipe from Rose Levy Beranbaum, the author of the Cake Bible, which is one of my go-to books for anything cake related. Rose does a beautiful job of explaining the different types of cakes, and also provides the basic formulations for major ingredient according to cake type (ie, pound, sponge, Angel Food cake, chiffon cake, etc) in the event that you want to develop your own recipe. For these cupcakes, I chose to try her white velvet butter cake. With a name like that, who can resist? This cake did not disappoint. It was light but not too light and stood up to the heaviness of the buttercream. For the buttercream, I used a version of Wilton’s classic buttercream, which is also found on the SweetSavoryLife blog. In a medium bowl, lightly mix egg whites, 1/4 cup of milk, and vanilla and set aside. In a large mixing bowl, combine all dry ingredients and mix on low until combined, then add the butter and the remaining milk. Mix on low until the dry ingredients are incorporated. Then, increase speed to medium and continue mixing for 1.5 minutes to build the cake's structure. Scrape down the sides and gradually add the egg mixture in three batches, beating for 20 seconds between additions and scraping down the sides with a spatula. Fill cupcakes liners between 1/2 and 3/4 full (do a test first to see which you like better) and bake for 12 to 15 minutes until tester inserted in the center comes out clean. Cream the butter on low for 2 minutes. Gradually add the milk, 1 tablespoon at a time until desired consistency is reached. Be careful not too overbake. I changed the vanilla to rose water and pink colouring, which has been a hit with my wife, kids and co-workers. Thank you, Emma. Strong wind gusts now, and some people are losing power. I can’t wait until tomorrow – gonna be a scary night.